Guelph is a university and manufacturing city with a population of more than 100,000. The City of Guelph is located in the heart of southern Ontario, just 100km west of Toronto. Its diverse economy also includes high technology enterprises and today Guelph is one of the fastest growing economic regions in all of Canada. Similar to Fergus and Elora, Guelph was founded by Scottish settlers in the 1820s at the junction of the Eramosa and Speed Rivers. Guelph and Wellington County offer a wide variety of festivals and events for the whole family to partake in. Make sure to visit Blossom Hill Fun Farm for PumpkinFest! Admission includes a FREE PUMPKIN, wagon rides, haunted house, straw jumping, corn maze, petting zoo and loads or other fun! The city features many trails for hiking, biking, skiing and horseback riding and a variety of riverside dining establishments. 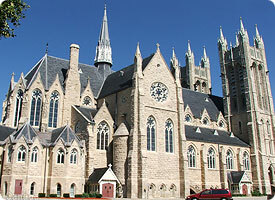 Guelph's most stunning architectural feature is the impressive Church of Our Lady Immaculate, a Gothic-Revival structure begun in 1877 and completed in 1888. The twin towers, more than 200 feet high, were not completed until 1926. The University of Guelph is a medium-sized university established in 1964. While the U of G offers degrees in many different disciplines, the university is best known for its focus on life sciences, based in part on a long-standing history of achievement in Agriculture and Veterinary Medicine and within Canada for its School of Fine Art and Music. The University of Guelph is presently ranked by Maclean's magazine as the top comprehensive university in Canada ("comprehensive" indicating institutions with significant research activity and a range of programs at the undergraduate and graduate levels, including professional degrees). It has also held this ranking in 1999, 2002, and 2003, with its reputation, innovative research-intensive programs, and lively campus life cited as particular strengths.